H-E-B has brought in Austin Mahone in its Back to School From A to Z ad campaign. The 21-year-old singer and songwriter stars in a 30-second spot singing in a high school an original song, and showing off his dance moves. Other students join him, as well, dancing and putting on display various items necessary to get back to school, from notebooks to backpacks. “Buy everything you need to fill the locker and the lunch box for less. All in one place.” – the voiceover says at the end of the commercial, adding that “it’s easy as H-E-B”. 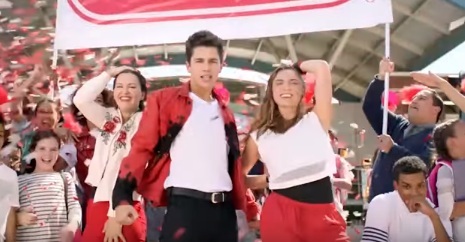 Austin Mahone, who is now sponsored by Fossil and endorses therefore the brand’s watches, has starred in several other commercials in the past, promoting McDonald’s Breakfast, in 2013, and Aquafina’s Flavorsplash line of sparkling flavored water, in 2014. This year, he released a new mixtape, ForMe+You, with eight new tracks and features from Pitbull, Juicy J, and 2 Chainz. His Pitbull-assisted lead single “Lady”, which made its worldwide debut on New Year’s Eve, has become Mahone’s most streamed track on Spotify.